What If Britain Didn’t Join The Iraq War? All right, I ended up writing this after a discussion online. The political situation in Britain, 2002/3, was something of a historical oddity. To sum up a long and complicated story, Tony Blair became Leader of the Labour Party and managed to create his own political consensus, which he termed New Labour. His plan was to appeal to marginal Conservative voters who disliked the Tory Party (Thatcher polarised the Tories as much as she did anyone else) but manifestly disliked the idea of dour Old Labour. This succeeded remarkably well, allowing him to crush the Conservatives in the general election. It did not take long for cracks to appear behind the scenes. New Labour was hip, Cool Britannia, all about being flashy and promoting Britain. Old Labour was dour, cynical, deeply suspicious of the monarchy and reflexively anti-American. Blair rapidly emerged as a narcissistic personality that not only refused to tolerate bad news, but also struggled to ‘spin’ bad news into good news. It was important for him to seem important – and he saw 9/11 as a godsend, allowing him to parlay his way into becoming a major global player. However, he also managed to give President Bush the expectation that Britain would provide all the support America wanted, without gaining anything in return. Unsurprisingly, the push towards war was challenged in Britain. Blair was lucky; New Labour was largely behind him, while the Tories were lukewarm about taking a valid anti-American stance. Blair suffered defections from his party, but he managed to keep the loyalty of key supporters – including Gordon Brown – and managed to push the vote for war through the Houses of Parliament. France helped by making it clear that recourse to the UN was not an option, allowing Blair to blame the breakdown of talks on the French. Britain would take part in the war. This caused something of a political/military separation between the US and UK forces in Iraq. Because it was important to keep the narrative of a separate war – and then ‘peaceful’ Basra vs. violent Baghdad – British and American forces often ended up working at cross-purposes. For example, the US-backed Iraqi Provisional Government needed the backing of Shia militias, which meant they would put pressure on the UK not to prune them back sharply (thus ensuring that the UK never really controlled Basra); in the meantime, UK officials were reluctant to admit that Iran was gradually gaining in influence in Basra and that everything achieved in Iraq was at serious risk of being lost. Blair was riding a tiger. One slip and he might have fallen off. I see Gordon Brown as one of the key personalities here; Brown not only wanted to be Prime Minister himself, he also thought that New Labour had gone too far in reshaping the base of what the Labour Party was supposed to stand for and planned to roll back the clock. However, Brown is in something of a blind. Open disloyalty to the party leader, particularly disloyalty that led to a vote of confidence, would certainly make him look very bad. Let’s have Brown ask a few more questions of Blair, then challenge his optimistic assumptions about the outcome of the war. This probably won’t go down well with Blair, who will begin (as always) to try to mock the messenger. Brown’s position, however, gives him good grounds to be suspicious of any assumptions. His supporters in the party, including Robin Cook, line up behind him, goading him into a direct test of strength against Blair. He challenges not only the reasons for the war, but everything from the lack of UN support to the apparent shortage of any plans for the post-war Iraq. This plays well to Old Labour – they distrusted the United States – and also causes doubts to spread through New Labour. This creates a major headache. If Labour’s two heavyweights fight it out, whoever wins will inherit a broken party and probably lose power completely. Blair attempts to do an End Run around Brown by forming an alliance with the Tory Party. However, the Tories have been having their own doubts. Their price for joining Blair in a coalition government (which in itself would be utterly bizarre by UK standards) is the adoption of several Tory polices. A number of Tories loathe Blair and want to watch him self-destruct. Others take a look at the shortage of plans for post-war Iraq and start to worry. At this point, the promises Blair has made to Bush blow up in his face. Brown is outraged – and he’s not the only one – that Blair basically told Bush he could commit Britain to war on his own authority. The Tories are equally hacked off, for different reasons. Blair finds his political position disintegrating around him; everywhere he looks, there’s another major crisis or a political defection. A sharp-eyed Parliament is looking at every military move and assuming the worst, that Blair is likely to push Britain into war without authorisation. Former military officers add to the chaos by pointing out that Blair has overseen a number of cuts, some of them quite dangerous, to the British military. Blair gambles. He calls a snap vote in the Houses of Parliament and lays out his case for war. It goes down about as well as Robespierre’s final speech in France; one by one, Gordon Brown, Robin Cook and Iain Duncan Smith rise to condemn the march to war. By the time the day ends, Blair’s position has been utterly destroyed. He resigns as Prime Minister and Leader of the Labour Party the following day, if only to prevent a Vote of Confidence that would lead to a general election. Gordon Brown becomes Prime Minister largely by default, but – to a very dangerous degree – Britain has a coalition government. Brown and Bush have a long and somewhat unpleasant series of talks. Bush was always more aware of Blair’s weakness than it seemed (historically, he did offer to accept Britain largely staying out of the war) and Brown has far less room to manoeuvre. 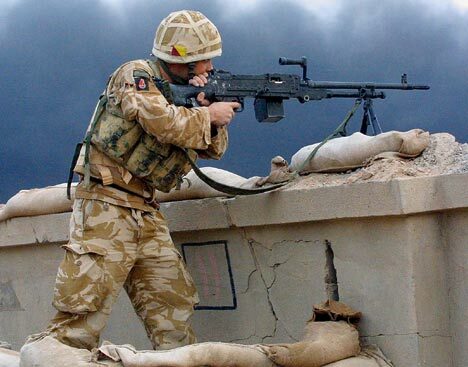 They compromise; a handful of British SF operators will serve in Iraq, while Britain will reinforce its commitment to Afghanistan, thus allowing more American forces to be redeployed to Iraq and used there. The Pentagon hastily revises the plans to move American troops to Kuwait, now that Basra will have to be taken by an American force. (Among other things, the 4th Infantry Division gets rushed to Kuwait.) No matter what happened in the UK, the generals think, the war will begin on schedule. No (or very limited) British participation in the war makes for some minor changes, at least in the early stages of the invasion. American forces will still push north, but several units will have to be deployed to secure Basra. This will hamper American plans to race to Baghdad, but – perversely – it will allow more time for the US to secure its lines of communication and deal with Saddam’s stay-behind units. America will, overall, advance much slower, but do a better job of clearing the rear first. Saddam will not, I suspect, see any prospect of the US launching an attack from the north in this timeline. The 4th ID posed a threat Saddam took seriously, even though Turkey had refused to grant permission for the US military units to cross its territory and deploy into Iraq from the north. Instead, Saddam will rotate his units to the south … which may not make much difference, as the US will have complete control of the air. The US may find that the passage through the Karbala Gap costs more than it did in OTL, but the Iraqis are unlikely to be able to stop them. However, this does give Saddam more time to prepare his capital to stand off the Americans. This causes a political nightmare for the US; from a purely pragmatic standpoint, leaving the city to starve is the easiest way to deal with it, but politically such an outcome would be inherently unacceptable. Bush doesn’t want to have to deal with media reports of starving Iraqi children because the mean old US isn’t allowing food through the lines. In the end, the US would probably be forced to take the city by force, using the Thunder Run concept. Here is where things start to get interesting. If the Thunder Run concept was used in Basra, Saddam’s planners will have a good idea of what is coming their way. (Of course, given how divorced Saddam was from reality, they may not have a chance to prepare anyway.) The Iraqis will basically allow the US columns to punch their way into the city, then try to surround and destroy them. Historically, several of the US units almost did get overwhelmed by the Iraqis. Even so, the US has a great deal more firepower and absolute command of the air. The Iraqis are unlikely to be able to stop the US, but they can ensure that taking the city costs the US badly. By the time the fighting finally grinds to a halt, a number of Americans are dead, large parts of the city have been devastated and thousands of innocent Iraq civilians have been killed in the crossfire. Saddam’s forces make matters worse by hammering the city’s power, water and sewer systems as the city falls, trying to give the US a major crisis to cope with. Perversely, the US actually has a better position than it did in OTL. The enforced pause to deal with Basra swept a great many future insurgents out of existence (as well as capturing or destroying supply dumps), making it much harder for the regime loyalists to prevent the US from moving supplies through the country. Furthermore, far more regime loyalists and foreign jihadists rallied to the final battle and were killed there. On the other hand, the US is still spread pretty thin and there are already clashes between Kurds/Shia and Sunnis. Worst of all, perhaps, Saddam has escaped the city and remains at large. The US has a major problem. No matter what promises they make, they cannot possibly actually keep them for months or years after the invasion. Iraq’s infrastructure is a mess, Former Regime Loyalists (FRLs) are hitting any collaborators they see and the delicate balancing act between the various ethnic and religious groups is starting to come unglued. Both the Kurds and the Shia have been engaged in limited ethnic cleansing, the former clearing Sunnis out of Mosel and the surrounding regions while the latter have been driving Sunnis out of Basra and the south. Unsurprisingly, this feeds hatred amongst the Sunnis, who see themselves as having no choice, but to fight back. Matters are complicated by the sheer incompetence of several US officials. Rumsfeld and his supporters have been planning to draw American forces out of the country, thus making it impossible for the occupation government to know what it can count on from a day to day basis. Worse, just about everyone who was anyone in Iraq was a party member. Now, party membership is grounds for barring someone from holding a government post. Sunnis who might otherwise have supported the occupation have largely joined the insurgency. As the summer grows hotter, so does the war. The first attempt to put together a provisional government flops. The Sunnis boycott the government in droves after the first three members were rejected on grounds of ties to the Baath Party. (They were actually minor members of the party, people who had to join to keep their jobs.) The Shia and Kurds come to a covert agreement to marginalise the Sunnis for the next decade; the Shia start putting together plans for a Shia theocracy. Worried, the US decides to unilaterally cancel the plans for handing power over as quickly as possible. There are just too many problems for the US to solve quickly; the Kurds may be inclined to assist the US, but the Shia are suspicious (the US let them down in 1991/2) and more inclined to turn to Iran. Shia troops flock to US-run recruiting stations for the New Iraqi Army and Iraqi Police, but once in the field they tend to be either militias – instead of stopping the cleansing they are actually making it worse – or cowardly. Unsurprisingly, the insurgency grows hotter and hotter, plunging Iraq into civil war. The US is forced to struggle to move supplies from Kuwait to military bases in Iraq. The US’s solution to this is to start turning Basra into a shipping hub. Supplies will be shipped through Basra to Baghdad, cutting miles off the journey. This is greeted with mixed feelings in Basra; on one hand, the increased traffic will provide thousands of jobs, but on the other hand the militias have gotten used to a free hand. More to the point, Iran’s proxies want to keep the Shia resoundingly opposed to the US. Various agents keep spreading propaganda, pointing out that the US abandoned the Shia once and will probably do it again. Matters are made worse by the arrival of a second wave of foreign fighters (from Syria, Saudi Arabia and several other Muslim countries.) AQ has arrived in force, offering the Sunnis help and support – and the Sunnis have few others to turn to. Their involvement, on the other hand, makes it much harder for the US to consider doing any deals with the Sunnis, after 9/11. The insurgents rapidly start attacking Shia targets, which incite retaliatory attacks, which in turn provoke more attacks. US troops are caught in the middle as civil war sweeps over southern Iraq. With elections looming in the US, Iranian-backed proxies attack several US supply lines and contractors in Basra. Some of the attacks succeed, but others fail disastrously; however, when the US gives chase, they run into problems with Shia militias in the city. It dawns on the US that the Shia have effectively created a state of their own and, worse, that they are collaborating with Iran. Indeed, various army and police units have turned into the spearheads of militia formations. The proof that Iran has been supplying weapons to the insurgents cannot be denied. Bush knows he cannot hesitate, not with elections breathing down his neck. His solution is to move reinforcements into the region and attempt to cut off the supply lines from Iran to Iraq, while delaying any more violent solution to the militias. This works, at first, then small US patrols are engaged by both Shia units and deniable Iranian proxies. Fire is exchanged regularly between Iranian and American warships. As Bush wins the elections, US officials have to come to terms with the fact that the Shia have effectively become the enemy … and they cannot rely on the Sunnis either. It starts looking as though the war is unwinnable. Having won the election, Bush doubles down and orders various American military officers to come up with a plan to turn the situation around. Their conclusion is that the US should focus on the Kurds and redeemable Sunnis, then deal with the Shia and their Iranian backers. This causes political problems, however; US-backed Kurdish factions will irritate both Turkey and the rest of Iraq. However, it is the only reasonable approach to take. US forces are surged forward into Baghdad and various other locations in Central Iraq. They rapidly start working with the local population, hiring as many Sunnis as possible to serve as everything from soldiers and policemen to workers and guards. This shift in power helps reassure wavering Sunni factions, while at the same time undermining Shia factions who opposed the US. As more and more terrorists are rooted out, the US shifts slowly towards preventing ethnic/religious cleansing and working to separate redeemable Shia from Iran-backed terrorists. It isn’t easy. Iran has no intention of letting the Shia go, not when they see a chance to take most of Iraq for themselves. However, as the US is flowing more combat power into the Gulf, Iran finds itself largely boxed in. The US isn’t inclined to turn a blind eye to Iranian probes across the border, nor is it willing to let its ships be harassed. Indeed, now that the US controls the oil wells and harbours, Iraq is slowly starting to export more and more oil to Europe, America and even China. There are even plans to build a pipeline across the desert through Jordan to Israel or Lebanon. Bush’s military commitment is matched by a reformed economic and technological commitment. The US military may dislike nation-building, but that is what it finds itself doing as 2005 becomes 2006. Iraq has resources, including manpower and oil wealth; it just needs to be able to apply it. Each success leads to more success, slowly weaning some Shia factions from Iran. Bit by bit, Iraq turns the corner as more and more tribes sign up to the American side. AQ terrorists are slowly rooted out or forced to flee into Styria. The Shia see the Sunnis slowly reasserting control of Iraq and start breaking with Iran openly, keen to get in on the act before it’s too late. They are rewarded by being allowed to stand for elections, although this worries the Sunnis. The Shia are still the demographic majority in Iraq. Ok, this is a short essay – but, I feel, an important one. Let’s start with a simple exercise. Take the single most racist/sexist/homophobic/etc argument you can think of. Think it through, piece by piece. Consider all the implications of each and every word. And then dismantle it. Prove to yourself, if no one else, that the argument is false. Ok, you may ask, what was the point of that? There are people who believe the most stupid and absurd things about their fellow men and women. You don’t have to go prowling around in the darkest depths of the internet to hear people cheerfully sprouting off shocking, indeed horrific pieces of crap about [insert racial, ethnic, sexual, etc group here]. The internet confers anonymity on most people and the absence of any form of social control allows our darkest impulses to take flight. Things people would never dream of saying in public are said online, things that many people (and not just those on the Left) would consider Hate Speech. But Hate Speech is, in itself, a slippery concept. What is Hate Speech? Answer – it’s whatever the listener wants it to be. You can outline a whole series of facts – not opinions, facts – and someone will probably accuse you of committing the dread sin of Hate Speech. It is starting to reach the point where people are censoring themselves because they are scared of being accused of Hate Speech, Wrong Think, etc. A decent idea – you shouldn’t call people racial slurs to their faces – has become a tool for restricting free speech. Earlier, I blogged about the free marketplace of ideas. Free speech is a key part of that market place, if only because it allows each and every idea to be tested, retested and then kept or discarded as necessary. Most racist/sexist/homophobic/etc arguments simply do not hold water when actually tested. However, classing all such arguments as Hate Speech and sealing them away, without actually debating the matter, really doesn’t help. Indeed, it lends credence to ideas that are often stupid, if not downright malicious. The human mind does not like being dictated to, even when the dictators are correct. Telling someone ‘BAD THINK, BAD THINK, BAD THINK’ doesn’t really help; proving, using common sense if nothing else, that the arguments are actually poor ones works to disarm them. Nor does the human mind appreciate the double-standard of ‘hate speech for me, but not for thee’ put forward (openly or not) by far too many so-called liberals. Hypocrisy is easy to spot and always hated. Yes, you may find yourself dismantling the argument time and time again. It’s much better than burying a festering sore by declaring all open discussions of the matter verboten. And it will teach people to think. Believe me, there is nothing more important in this day and age. There are times when I have a reaction to something without knowing precisely why I have a reaction. It’s always frustrating to think that I don’t like something without knowing precisely why I don’t like it. And one of those things is Rachel Swirsky’s short story; If You Were a Dinosaur, My Love. I didn’t like it and I honestly don’t know why it won an award – it certainly isn’t speculative fiction – but I couldn’t put my finger on why I didn’t like it. The story is extremely emotional – and it is good at conveying that emotion. I felt for both of the main characters, neither of whom deserved to undergo either real or spiritual torment. It’s the mark of a good author to get someone into the head of a character and Rachel Swirsky manages that very well. Indeed, I have never read anything else by her, but I will certainly look it up when I have the chance. But I still don’t like the story. It wasn’t until today that I understood why. It’s hopeless. The main characters have no hope. But he isn’t a dinosaur. And he’s still in a coma. I was bullied at school, badly and relentlessly. Yes, I know what it’s like to feel helpless. I know what it’s like to wish for super-strength or something else that would allow you to beat up your tormentors or otherwise take control of your life … and then to go back, time and time again, to reality, where the truth is you’re defenceless. With that in mind, I understand precisely what is going through the narrator’s mind. If her lover was stronger, if he was better able to defend himself, the story might have had a very different ending. But he wasn’t and it didn’t. If the story had been one where the victim learns how to fight back effectively and does so, it would have been a far better story. An uplifting version of the tale where someone turns the tables on the bullies would be far more thrilling. Or, perhaps, one where the narrator sets out to take revenge … maybe she becomes a crime-fighter, or a policewoman, or a lawyer … it would have been a far more satisfying story and it wouldn’t have been so hopeless. At the very least, even an ultimately doomed attempt to punish the thugs responsible for the attack would have made a better story. There is a place for doom and gloom in speculative fiction, but I think it’s all about hope. Hope that the human race can overcome difficulties and take to the stars, where we belong. Even a story as seemingly apocalyptic as Dies The Fire and its sequels (SM Stirling) is ultimately about the human race overcoming its new limitations and rebuilding a viable civilisation. Or The Magic Goes Away (Larry Niven), which is a thinly-veiled analogy for oil shortages, has hope. There may no longer be magic, but humanity will go on and overcome. Human ingenuity will take us far further than the naysayers ever deemed possible. A story that features the last survivors dying out, perhaps one cannibalising the remainder, is not a hopeful story. There is a reason The Screwfly Solution is a horror story. No matter what happens, there is no hope. And there is none in If You Were a Dinosaur, My Love either. It is my belief that we, the human race, are destined to go to the stars. Yes, we have problems; yes, we will overcome these problems. Our lives today are far better, on any number of counts, than the lives of our ancestors, even those who lived a mere 100 years ago. Our lives in the future will be better still, once we go into space for good. Stories that show humanity rising to the challenge and overcoming our problems – be they on a small or large scale – echo down the ages because they speak to the greatness inherent in the human soul. We’re humanity! We may make mistakes, we may be knocked down, but we get up again and keep going. Uplifting stories will always be better, always be remembered longer, than stories that wallow in doom and gloom. SF and speculative fiction isn’t the only place to find uplifting stories. A story about a young man overcoming racism, or a young woman overcoming sexism, or a homosexual overcoming homophobia might also be uplifting. Someone struggling against the limits of their society or a story about someone suffering a serious injury or illness, yet picking up and carrying on with their lives … yes, that would be uplifting. There would be hope. Hopelessness will destroy us. The spiritual lassitude, the helplessness, of the narrator of You Were a Dinosaur, My Love is corrosive, weakening her ability to resist, let alone forge a new path or take control of her destiny. Resistance is not only futile to her, it is inconceivable. She thinks of herself – and her lover – as nothing more than the helpless victims of fate. In truth, they were beaten a long time before her lover ever ran into a bunch of thugs. This says a great deal about the West today. We spent 50 years trapped in the shadow of nuclear war, a war that would destroy both sides. We were scared and we allowed that fear to hold us prisoner. Now, facing a far lesser challenge, we find it hard to stick up for ourselves, to raise a hand in our own defence. We spend more time coming up with excuses for the enemies of civilisation than we do plotting ways to fight them. … Because fear leads to hopelessness, and hopelessness leads to death. Really, just a small set of updates. First, you can download A Savage War of Peace now, from here. Second, a new snippet for Trial By Fire (Schooled In Magic VII) is up now. Things nearly went off the rails a couple of times. I sent my collection of books via courier and, when they arrived, the boxes were badly damaged. Luckily, the books themselves were largely intact and only a handful had to be held back. Pete Buck – editor and publisher of ELSEWHEN PRESS – deserves credit for selling my books (and not just the ones he publishes himself). …Well, let’s just say it’s a good thing I’m not trying to earn money by writing music. And after the third or fourth repetition people were starting to give me odd looks. On the downside, I went to a signing and … well, I didn’t have many people waiting for me to sign their books. (In hindsight, I should probably have asked people who bought the earlier books to come let me sign them there.) If anyone ever feels my ego is getting too big, just mention the EASTERCON signing to me and my ego will deflate back to galaxy-size. Fourth, while I was at EASTERCON the Hugo Award nominees were announced. I really kept planning to write a post on the Hugo Awards, and Sad Puppies, and suchlike before time ran out. It floundered on the lack of anything substantial to say, so what I WILL say is this. I’ve checked the list of Hugo winners and runners-up on wiki and quite a few of the more recent novels were not what I considered to be entertaining. A book can have vast concepts and sweeping vision, but would it really be a decent story if it wasn’t entertaining? Furthermore, just who decides on which novel is actually a winner? If the rules say that anyone who purchases a membership can nominate or vote as they see fit, how can anyone complain about the result? There are quite a few books on the list I don’t think deserved awards. Does that make the voters wrong? I cannot say that I am amused by the vitriol being thrown around by both sides of the dispute. Like Gamer Gate, the original issue (however valid or not it may be) is being buried under a mass of abusive screaming. None of this is helpful. Call me an idealist if you like, but I have always thought that civil arguments were the way to greater understanding – or at least agreeing to disagree. But then, it only takes one person to turn a reasonable debate into a flame war. If you intend to vote, here’s my advice. Ignore everything you hear about the books, just read them and make up your own mind. If you like Book A, vote for Book A; if you like Book B, vote for Book B. Finally, we should be going to RAVENCON later in the month, then New York. Does anyone reading this blog live in New York? If so, I’d love to meet. More importantly, this is the last chance to pre-order any signed copies of my work. Let me know by Sunday or I may not be able to obtain a copy in time. Caleb stopped outside the stone door to his father’s study and paused, feeling his heart pounding inside his chest. He had few good memories of his father’s study; the children had never been allowed to enter, save for long lectures and punishments when they’d disappointed their parents. Caleb had never dared to try to break the complex network of spells on the lock, knowing that it would displease both of his parents. Caleb bit his lip, then pushed at the door. The house was small – living space was at a premium in Beneficence – and his mother had had over twenty-five years to weave protective spells and wards into the stone building. She’d always known what her children were doing, while they lived in her house; her children had rapidly learned to keep their misdeeds well away from their home, if they didn’t want to get caught at once. He shivered as he felt another protective ward shimmering over him as he stepped through the door, then bowed formally to his father. His father looked at him for a long moment, then nodded. Beside him, Caleb’s mother kept her face impassive. They made an odd couple, Caleb had often thought, once he’d grown old enough to meet other soldiers and magicians. General Pollock – his father – was short, stubby and muscular, tough enough to march with the younger men instead of riding a horse to battle, while Mediator Sienna was tall, willowy and one of the most experienced combat sorcerers in the Allied Lands. She might not have been classically beautiful, her stern face edged by long black hair, but she was striking even after giving birth to five children. And there were few people who would dare to insult her to her face. Caleb took a long breath. Casper – handsome Casper, confident Casper – would have found it easy to speak to their parents, he was sure. But his elder brother had basked in the approval of their father, while even their stern mother could rarely remain angry at him for long. What Casper wanted, Casper got. Their parents hadn’t really spoiled him, Caleb had to admit, but he’d had advantages none of the younger children shared. He’d set out to walk in their footsteps, after all. His parents exchanged glances. A simple relationship was one thing, but a courtship was quite another. It implied that Caleb was willing to spend the rest of his life with the girl, if she proved receptive to his advances. And his parents … they might have to welcome the girl into their family, if the courtship worked out. Caleb was the first of the family to discuss a courtship. Even Casper had yet to bring a girl home to meet his parents. Caleb bit down the response that came to mind. His father had expected his children – his male children, at least – to go into the military, to fight for the Allied Lands. Casper, whatever his flaws, was a halfway decent combat sorcerer. But Caleb? He’d always been more interested in raw magical research than fighting. The transfer to Whitehall had been the best thing that had ever happened to him. General Pollack gave her a surprised look. Caleb couldn’t help staring at her in astonishment. His mother might be formidable, but it was rare for her to disagree with her husband in public. Caleb knew they’d had some spectacular rows, yet they’d always been held in private. They’d always put forward a united front. Caleb swallowed. That was the question, wasn’t it? He had never been able to read a girl, to tell if she was interested in him or if she was just being polite. The lads in the barracks had bragged endlessly about how many girls they’d slept with – Caleb was privately sure most of them were lying – but he had never had a serious relationship with anyone. Stronghold had had only a handful of female students, while he’d been too busy at Whitehall to consider the possibilities. He’d never had the nerve to go into a brothel when he’d been on leave. He cursed under his breath. It wasn’t something he wanted to talk about, not to his blunt plainspoken mother, but it was clear he wasn’t being offered a choice. His father’s brief lecture on matters sexual had been bad enough, back when he’d started to realise there was something different about girls, yet this was likely to be worse. He cringed mentally, then steadied himself. At least they hadn’t said no. Just a dream, she told herself, as she wiped her forehead. It was just a nightmare. It wasn’t real. Aurelius slithered forward – she giggled helplessly as the snake crawled up her arm – and settled around her neck. She reached into her pack, pulled out a piece of dried meat and offered it to Aurelius, then pulled her trousers on, followed by her shirt. Sleeping without her clothes hadn’t been easy, but it had just been too hot inside the tent. The Grandmaster had forbidden her to use magic unless it was urgent. Thankfully, he’d insisted on keeping watch half the night rather than sharing a tent with her. She crawled forward and opened the flap, then poked her head out of the tent. The Grandmaster was sitting in front of a fire, his back to her, cooking something that smelled faintly like bacon, although she had no idea what it actually was. It smelled good, but the stench of the Blighted Lands – a faint hint of burning that seemed to grow stronger with every breath she took – threatened to overpower it. “I don’t sleep,” the Grandmaster said. Emily stood and looked around. The Blighted Lands were strange, perhaps the strangest place she’d ever seen. Lands that had once been green and verdant were now covered in a thin layer of ash, without a single living thing apart from the pair of them in sight. A faint haze shimmered in the air, making it hard to see beyond a few dozen metres. The sky was a dull grey, the sun barely bright enough to burn through the clouds hanging in the sky; the air was unnaturally still, tinted with the faint scent of burning and flickers of raw magic that flickered across her awareness for long seconds before fading away. She could barely force herself to remain calm, even though she knew there was no real threat. The landscape spoke to her on a very primal level. Emily nodded. If anyone else had tried to hang a Death Viper around their neck, she knew all too well, it would have killed them within seconds. It was hard to remember, sometimes, that Aurelius was one of the deadliest creatures known to exist, with a venom so poisonous that even a mere touch could prove lethal. Only the familiar bond protected her from the snake, allowing her to keep Aurelius as a secret weapon. He’d already saved her life twice. Emily swallowed. Years ago – so long ago it seemed almost like another life – Shadye had accidentally brought her to the Nameless World, seeking a Child of Destiny. It had never occurred to him that someone would be named Destiny, or that her child would be a literal Child of Destiny. Shadye had meant to kill her, to sacrifice her to something called the Harrowing, yet in some ways she was almost grateful to the mad necromancer. If she’d stayed on Earth, she was sure, she would be dead by now. They finished their breakfast, then Emily wiped the plates and cooking equipment while the Grandmaster answered the call of nature and then started to pack away the tent. He hadn’t wanted a tent for himself, something that made her feel vaguely guilty, but he’d dismissed the matter when she’d offered to sleep in the open too. She couldn’t help feeling relieved; quite apart from her concerns about sleeping near a man, she wouldn’t have cared to sleep in the open, not in the Blighted Lands. The raw magic seemed to grow stronger at night. She shuddered at the thought, then pulled the rucksack on and braced herself against the weight. The Grandmaster nodded to her, checked the campsite for anything they might have left behind, then led the way into the distance. Emily gritted her teeth, then forced herself to follow him. The flickers of wild magic in the air were growing stronger, the further they moved from the Craggy Mountains blocking the way to Whitehall. If she’d been alone, she had a feeling she would have turned back a long time before reaching the Dark Fortress. Emily glanced upwards. It was early morning, by her watch, yet the sun was already high in the sky. And yet, the light seemed dim, the clouds growing darker as they walked further into the Blighted Lands. She’d thought it was night, when Shadye had snatched her, but had his lands been buried in permanent darkness? Or was she merely imagining things? “I thought you said it wasn’t safe to lurk too close to the fortress,” she said, instead. He said nothing else until they stumbled across the ruins of a village, so hidden within the haze that they practically walked into the ruins before realising it was there. It was hard to imagine that it had once been a living village, with farmers tending their crops and raising their children; now, it was nothing more than gray stone, all life and light leeched away by the Blighted Lands. The eerie sameness sent chills down her spine. Emily nodded, then paused as she caught sight of a child’s doll lying on the ground. It looked … normal, surprisingly intact despite the Blighted Lands. But when she reached for the doll and picked it up, it crumbled to dust in her hands. She swallowed hard, trying not to cry for the girl who’d owned the doll, untold centuries ago. Had she died quickly, at the hands of a necromancer, or fled with her family to the untouched lands to the north? There was no way, she knew, that she would ever know. He took a long look around the village – Emily was sure he had some way to see, despite losing his eyes years ago – and then led the way out of it, back to the south. She followed him, feeling an odd urge to stay within the village even though she knew it was suicide. It worried her for a long moment – it could be a sign of subtle magic – and then she realised the village had felt safe, despite being within the Blighted Lands. The urge to turn back and flee grew stronger with every step they took. She touched the ring, hidden within her pocket, and smiled. Lady Barb had urged her to create and charge a second battery while preparing for the trip to the Blighted Lands and Emily had done as her mentor suggested. Now, she had a battery she could use, although without the value it was useless. Putting a second valve together with the help of an enchanter in Dragon’s Den had been harder than charging up the battery. She eyed the Grandmaster’s back, wondering if he knew just what she’d actually done. He hadn’t treated her any differently, when Lady Barb had returned her to Whitehall after the Faire, but he wouldn’t have done. Others … had stared at her in awe. In some ways, she was even dreading the day when the rest of the students returned to Whitehall. If they’d stared at her after beating Shadye – and they had – they would be paying far more attention to her now. … But, to anyone who didn’t know about the batteries, it might not seem absurd. She’d killed Shadye – and the Allied Lands had declared her the Necromancer’s Bane. The other necromancers seemed to believe she could kill them at will, if only because none of them had tried to claim Shadye’s lands or attack Whitehall. But that wouldn’t last, she was sure. Sooner or later, the necromancers would resume their offensive against the Allied Lands. Their endless demand for new victims to sacrifice would make sure of it. Emily paused, listening hard. There was a faint sound in the distance, a howling that seemed to come from many throats. It was growing louder, although she didn’t think the source of the sound was actually coming closer. Whatever it was – and there was something about it that touched a memory in her mind – it chilled her to the bone. Up Now–A Savage War of Peace (Ark Royal (Warspite) V! 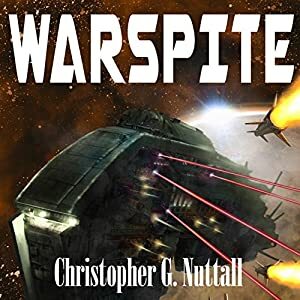 On her maiden voyage, HMS Warspite discovered Vesy, a world populated by primitive aliens, aliens whose culture had already been twisted and warped by human refugees from the First Interstellar War. Now, Captain John Naiser and his crew spearhead a diplomatic mission to the alien homeworld, hoping to ease them into the galactic mainstream. … And a civil war that will tear the human sphere apart. Download a copy from the link here, or check out the eBook/Paperback here!